Only 100 sets are available in our store including James Haick's upcoming, Ft. Myers based series called The Mall! The books included in this set are SHADOW PLAY by the red hot Richard Rivera (Stabbity Bunny) and Clara Meath, THE SOURCE By Don Handfield (The Rift and History's Knightfall) & Joshua Malkin , and THE MALL by James Haick, Don Handfield and Rafael Loureiro. Grab them while they last! Solar Flare Season 2 #4 is Out NOW! Season 4 #2 came out last week! Grab it now by clicking our STORE link! I'm very excited to hear everyones thoughts on these last three issues of the Season 2. Big things are in store for Season 3!! Solar Flare Season 2 #3 is Out NOW! Season 2 has been going strong! Issue #3 (#9) was just released this past weekend and it's a pretty key issue for Solar Flare fans. It marks the 1st appearance of 3 new villains and a major new character named Sammy Hurley. We have a few copies available in our store so be sure to check it out! We hope to announce some BIG NEWS soon! Stay tuned and happy new year! The first Solar Flare graphic novel (collecting issues 1-6) is coming out in early November. It's going to be called, Solar Flare Season 1: Fort Myers. As many of you may know, Fort Myers Florida was hit head-on in early September by Hurricane Irma. This category 4 storm caused so much damage and loss to many local businesses and families. The Solar Flare team and Scout Comics have come up with a plan to help. We've done a special 400 copy printing of the graphic novel were $15.00 of the $19.99 collected will be donated to two, local Ft. Myers charities. The two charities are United Way of Southwest Florida and the Harry Chapin Food Bank. The variant cover was done by the amazing artist Ben Bishop (TMNT, Drawing Blood, The Aggregate) and is pictured here. Convention Round up and more news! Hey All! I hope everyone is doing well despite all the crazy hurricanes and happenings that have occurred in the past few weeks. It's been a busy few month for us here at Solar Flare. We've been working away on the Season 2 & 3 while traveling the country doing conventions and comic store signings. New York Comic Con is typically the last big comic con of the year and while we weren't able to attend this year because of illness, we were represented by our publisher Scout Comics. They even released an exclusive cover of Solar Flare Season 2 #1. We'll have some for sale on the website in the next week or so. Early next month marks the release of not only the regular covers Season 2 #1, but also our first graphic novel Solar Flare Season 1: Fort Myers. We plan on doing a limited edition cover (Ben Bishop from TMNT, The Aggregate, & Drawing Blood fame) for this graphic novel (400 total) where $15.00 of the $19.99 go to local Ft. Myers charities (United Way of Southwest Florida and Harry Chapin Food Bank of Ft. Myers). As many of you know, Fort Myers took a direct hit from Hurricane Irma in September and being that its my hometown and the location of where the first arc of Solar Flare takes place, we thought it would be awesome to give back to the community. Stay tuned for more details on where to purchase the book. Now that convention season is concluded, I plan on updating things here much more frequently. Talk with everyone soon! Solar Flare TPB and Season 2 #1 available for pre-order NOW! Solar Flare Comic Vol. 1 "Fort Myers" is NOW available for preorder for the first week of October release! Request it now at your local comic store (PREVIEWS order code AUG171941) or preorder it by clicking the link below! Hey everyone! Issue #2 just came out last Wednesday May 10th and it's close to being a sellout. Myself, Greg Krivac and renaissance man Ryan Toohey will be in Buffalo, NY this weekend for Nickel City Comic Con. I'm almost finished with the script to issue #11 and I am so stoked about this particular issue. I can't wait to see Branko draw it and for everyone to hopefully read it! Before I go, here's the new cover Branko did from issue #7! 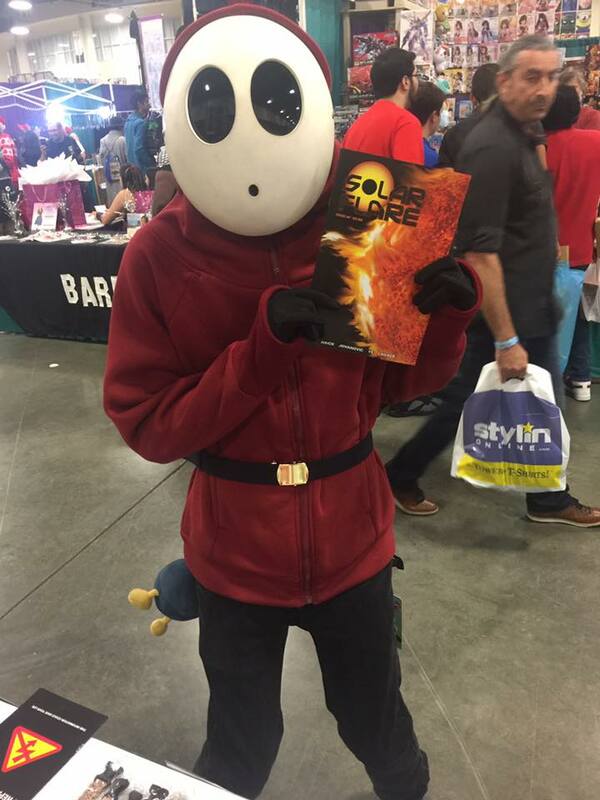 Solar Flare #1 (Scout Comics Edition) is SOLD OUT! 2nd Printing Coming! Great news! Solar Flare #1 is an official sellout and going back to a second print. Here's an exclusive look at the issue #1 2nd print cover that will be offered through our website and Diamond Distributors. I'll post the order code once it becomes available so you can request it from your local comic shop. Thank you all again for helping make our book a sell out! Solar Flare Convention Schedule Coming Soon! We should have our convention schedule for 2017 up soon! We plan on attending over 20 conventions this year all around the US! We look forward to meeting a lot of or fans! Stay tuned!! Solar Flare Signs Publishing Deal with Scout Comics! Happy Holiday's to everyone out there! We just got back from Paradise City Comic Con and are very excited about our plans for 2017! It's going to be a great year and I can't wait to announce some of the exciting things we've been working on these past few months. Until then, enjoy some great cosplay pics for this past weekends convention! Our next convention stop will be this coming month in Ft. Lauderdale, FL. We plan on announcing our new publisher at the event and our very much looking forward to it! We'll also be unveiling and selling our new Survival bags!